The impossible has never been so luxurious. Steampunk is more than settings and style; it comes alive with astounding technology! 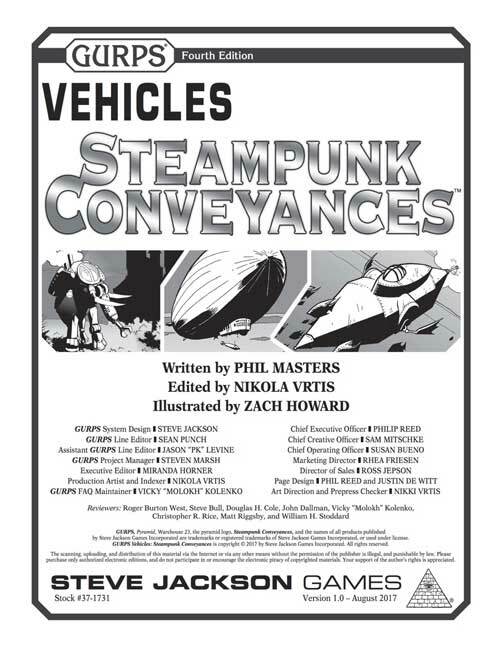 Add steam-based transportation to your realistic and fantastical 19th-century campaigns with GURPS Vehicles: Steampunk Conveyances. Discover over 30 different vehicles for land, sea, and space, from the personal iron horse to the planet-hopping solar steamer. Outfit your Victorian rides with an assortment of new weapons, then add the flavorful rules and adventure suggestions to your game. Get your tickets ready; tea awaits! 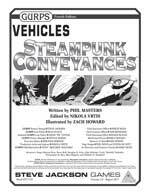 For the latest GURPS Fourth Edition insight into the genre, check out GURPS Steampunk 1: Settings and Style and GURPS Steampunk 2: Steam and Shellfire. Add new rules, campaign ideas, and dangers to your Victorian-era game with Pyramid #3/39: Steampunk.